Download "ICP-CC488 ICP-CC488 EN. Control Panel. 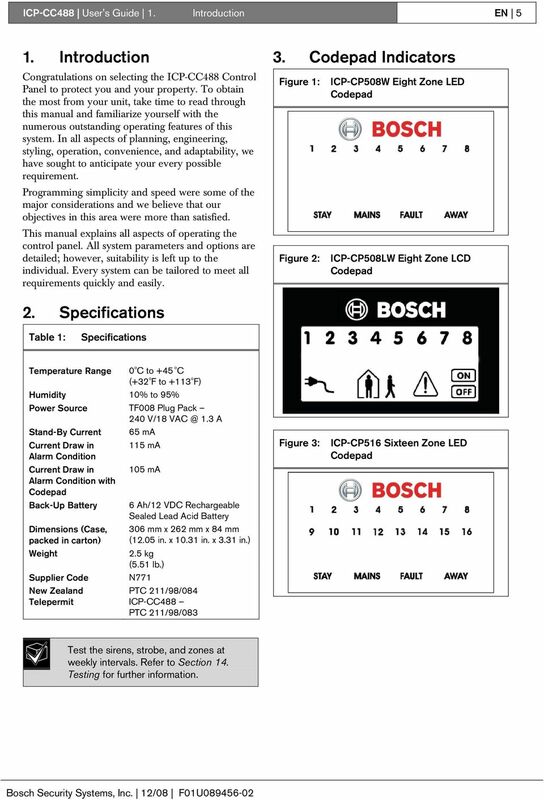 User s Guide"
2 ICP-CC488 User's Guide Notices EN 2 Copyright Notice Unless otherwise indicated, this publication is the copyright of Bosch Security Systems, Inc. ( Bosch ). All rights are reserved. You may download a single copy of this publication. By downloading the publication you agree that you will: (i) only use the publication for your own reference; (ii) not commercially exploit or charge any person for the use of the publication; and (iii) not modify the publication in any way without the prior written permission of Bosch. Except as specified above or where authorized by the Copyright Act 1968 (Cth), no part of this publication may be reproduced, transmitted, modified or stored, in any form or by any means, without the prior written permission of Bosch. Notice of Liability This material is designed for use by tradespeople with expertise in the installation of this product. Persons without appropriate expertise should seek assistance before attempting installation. While care has been taken in the preparation of this material, Bosch Security Systems, Inc. and its representatives will not be responsible to any person or entity for any loss or damage directly or indirectly caused by information in, or any omission from, this material. Bosch Security Systems, Inc. reserves the right to make changes to features and specifications of its products at any time without prior notification. 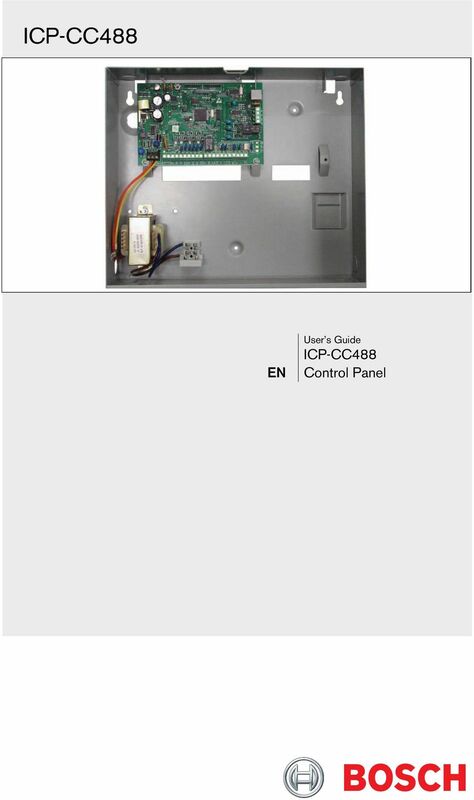 A-Tick The ICP-CC488 Control Panel is designed to comply with A-Tick. 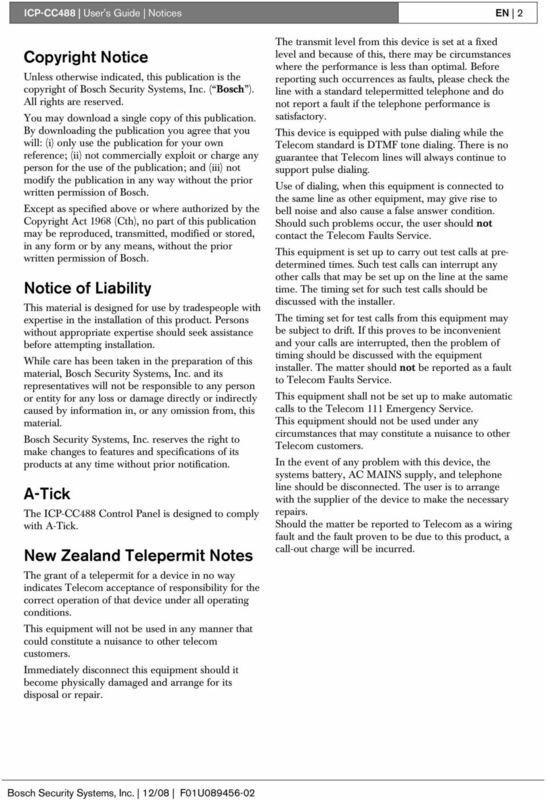 New Zealand Telepermit Notes The grant of a telepermit for a device in no way indicates Telecom acceptance of responsibility for the correct operation of that device under all operating conditions. This equipment will not be used in any manner that could constitute a nuisance to other telecom customers. Immediately disconnect this equipment should it become physically damaged and arrange for its disposal or repair. The transmit level from this device is set at a fixed level and because of this, there may be circumstances where the performance is less than optimal. Before reporting such occurrences as faults, please check the line with a standard telepermitted telephone and do not report a fault if the telephone performance is satisfactory. This device is equipped with pulse dialing while the Telecom standard is DTMF tone dialing. There is no guarantee that Telecom lines will always continue to support pulse dialing. Use of dialing, when this equipment is connected to the same line as other equipment, may give rise to bell noise and also cause a false answer condition. Should such problems occur, the user should not contact the Telecom Faults Service. This equipment is set up to carry out test calls at predetermined times. Such test calls can interrupt any other calls that may be set up on the line at the same time. The timing set for such test calls should be discussed with the installer. The timing set for test calls from this equipment may be subject to drift. If this proves to be inconvenient and your calls are interrupted, then the problem of timing should be discussed with the equipment installer. The matter should not be reported as a fault to Telecom Faults Service. This equipment shall not be set up to make automatic calls to the Telecom 111 Emergency Service. This equipment should not be used under any circumstances that may constitute a nuisance to other Telecom customers. In the event of any problem with this device, the systems battery, AC MAINS supply, and telephone line should be disconnected. The user is to arrange with the supplier of the device to make the necessary repairs. Should the matter be reported to Telecom as a wiring fault and the fault proven to be due to this product, a call-out charge will be incurred. 5 ICP-CC488 User's Guide 1. Introduction EN 5 1. Introduction Congratulations on selecting the ICP-CC488 Control Panel to protect you and your property. To obtain the most from your unit, take time to read through this manual and familiarize yourself with the numerous outstanding operating features of this system. In all aspects of planning, engineering, styling, operation, convenience, and adaptability, we have sought to anticipate your every possible requirement. Programming simplicity and speed were some of the major considerations and we believe that our objectives in this area were more than satisfied. This manual explains all aspects of operating the control panel. All system parameters and options are detailed; however, suitability is left up to the individual. Every system can be tailored to meet all requirements quickly and easily. 3. Codepad Indicators Figure 1: Figure 2: ICP-CP508W Eight Zone LED Codepad ICP-CP508LW Eight Zone LCD Codepad 2. Specifications Table 1: Specifications Temperature Range 0 o C to +45 o C (+32 o F to +113 o F) Humidity 10% to 95% Power Source TF008 Plug Pack 240 V/ A Stand-By Current 65 ma Current Draw in 115 ma Alarm Condition Current Draw in 105 ma Alarm Condition with Codepad Back-Up Battery 6 Ah/12 VDC Rechargeable Sealed Lead Acid Battery Dimensions (Case, packed in carton) Weight Supplier Code New Zealand Telepermit 306 mm x 262 mm x 84 mm (12.05 in. x in. x 3.31 in.) 2.5 kg (5.51 lb.) N771 PTC 211/98/084 ICP-CC488 PTC 211/98/083 Figure 3: ICP-CP516 Sixteen Zone LED Codepad Test the sirens, strobe, and zones at weekly intervals. Refer to Section 14. Testing for further information. 6 ICP-CC488 User's Guide 3. Codepad Indicators EN 6 Figure 4: ICP-CP516 Sixteen Zone LED Codepad 3.2 AWAY Indicator The AWAY indicator displays that the system is armed in AWAY Mode. The AWAY indicator flashes in unison with the STAY indicator when programming various options throughout the Operators Manual. Refer to Section Arming in AWAY Mode for information on the different methods of arming the system in AWAY Mode. Table 3: AWAY Indicator The codepad is the communications interface between you and your alarm system. Use the codepad to issue commands. The codepad offers both visual and audible indications that guide you through the general operation. The codepad incorporates numerous indicators. There are zone indicators used to show the condition of each zone. Four other indicators show general status. The following pages outline a list of situations and the relevant indicators that are seen. The ICP-CP516 Sixteen Zone Codepad must be used with sixteen wireless zone systems. The sixteen zone codepads operation and display similarly to 8 zones codepads, but also display the zones 9 through Zone Indicators The zone indicators (1 to 8) display the status of the zones. Table 2 lists the various circumstances that the indicators display (such as Zone Sealed, Zone Unsealed, and so on). Table 2: Indicator On Off Flashing Fast (0.25 sec on/ 0.25 sec off) Flashing Slow (1 sec on/ 1 sec off) Zone Indicators Definition Zone is unsealed. Zone is sealed. Zone is in alarm condition. Zone is manually isolated or selected to be isolated. Indicator Definition On System is armed in AWAY Mode. Off System is not armed in AWAY Mode. 3.3 STAY Indicator Table 4: The STAY indicator displays that the system is armed in STAY Mode 1 or STAY Mode 2. The STAY indicator also flashes in unison with the AWAY indicator when programming various options throughout the Operators Manual. Refer to Section Arming in STAY Mode 1 for different methods of arming in STAY Mode 1. Refer to Section Arming in STAY Mode 2 for the method of arming in STAY Mode 2. STAY Indicator Indicator Definition On System is armed in STAY Mode 1 or STAY Mode 2. Off System is not armed in STAY Mode 1 or STAY Mode 2. Flashing twice a sec Flashing once every 3 sec 3.4 System Disarmed Zone isolating mode or setting STAY Mode 2 zones. Day alarm status day alarm turned on. This indicator displays with the indicator when the system is disarmed. 3.5 MAINS Indicator The MAINS indicator displays that the system s AC MAINS supply is normal or failed. 7 ICP-CC488 User's Guide 3. Codepad Indicators EN 7 Table 5: MAINS Indicator Table 7: Audible Indicators Indicator On Flashing Definition AC MAINS power normal. AC MAINS supply has failed. 3.6 Off Indicator/Zone Sealed The indicator displays when the system is in the disarmed state and flashes when a zone becomes unsealed during the disarmed state. The indicator stops flashing when all zones are sealed. 3.7 On Indicator/Zone In Alarm The indicator displays when the system is armed in AWAY Mode and flashes when an alarm occurs. The indicator resets once a valid user code is entered. 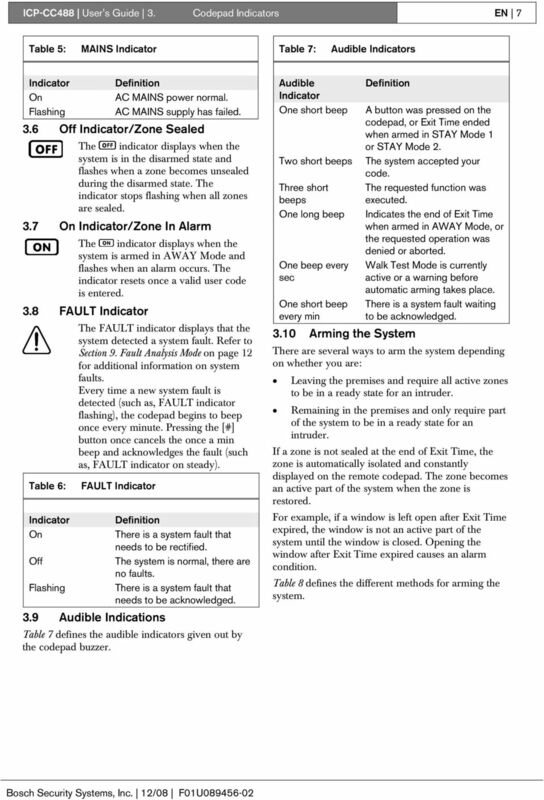 3.8 FAULT Indicator Table 6: The FAULT indicator displays that the system detected a system fault. Refer to Section 9. 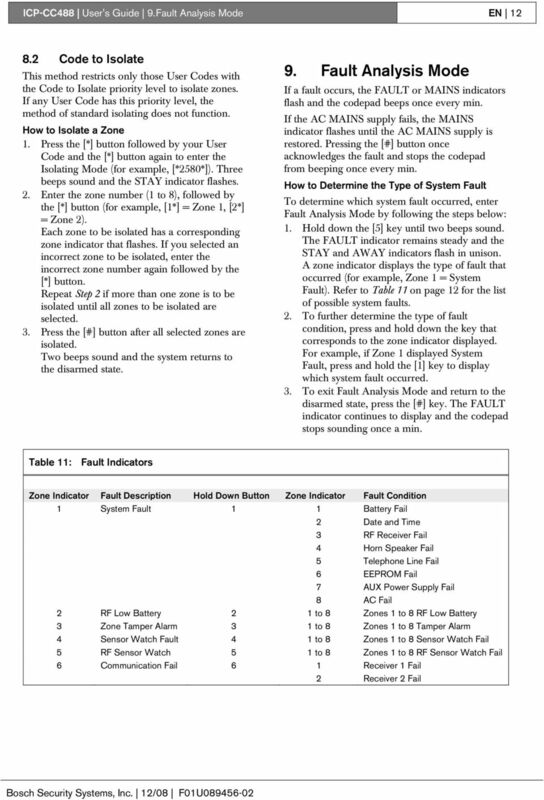 Fault Analysis Mode on page 12 for additional information on system faults. Every time a new system fault is detected (such as, FAULT indicator flashing), the codepad begins to beep once every minute. Pressing the [#] button once cancels the once a min beep and acknowledges the fault (such as, FAULT indicator on steady). FAULT Indicator Indicator Definition On There is a system fault that needs to be rectified. Off The system is normal, there are no faults. Flashing There is a system fault that needs to be acknowledged. 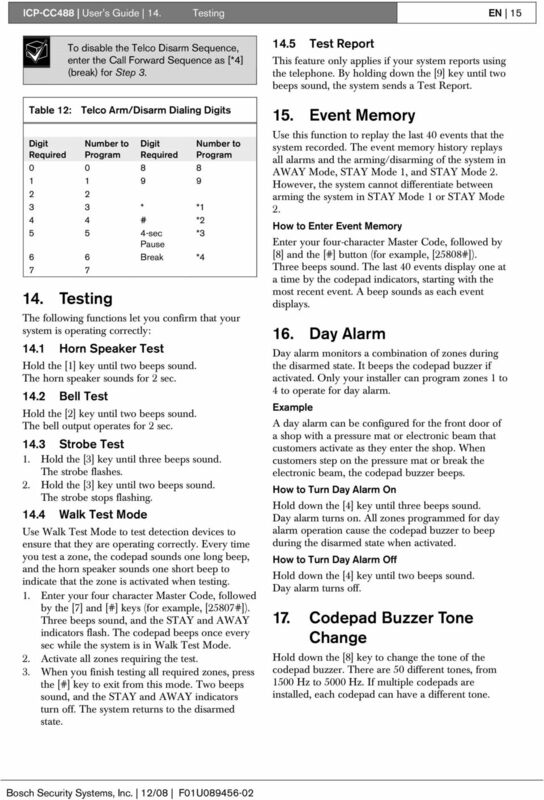 3.9 Audible Indications Table 7 defines the audible indicators given out by the codepad buzzer. Audible Indicator One short beep Two short beeps Three short beeps One long beep One beep every sec One short beep every min Definition A button was pressed on the codepad, or Exit Time ended when armed in STAY Mode 1 or STAY Mode 2. The system accepted your code. The requested function was executed. Indicates the end of Exit Time when armed in AWAY Mode, or the requested operation was denied or aborted. Walk Test Mode is currently active or a warning before automatic arming takes place. There is a system fault waiting to be acknowledged Arming the System There are several ways to arm the system depending on whether you are: Leaving the premises and require all active zones to be in a ready state for an intruder. Remaining in the premises and only require part of the system to be in a ready state for an intruder. If a zone is not sealed at the end of Exit Time, the zone is automatically isolated and constantly displayed on the remote codepad. The zone becomes an active part of the system when the zone is restored. For example, if a window is left open after Exit Time expired, the window is not an active part of the system until the window is closed. Opening the window after Exit Time expired causes an alarm condition. 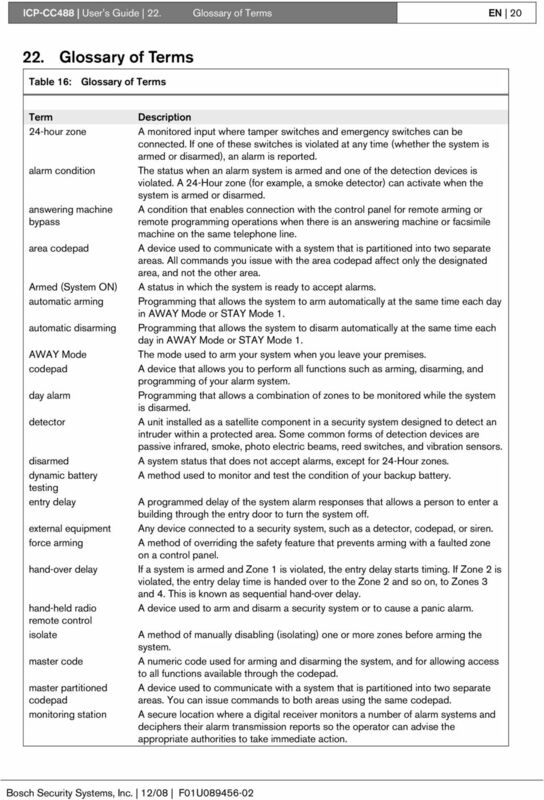 Table 8 defines the different methods for arming the system. 8 ICP-CC488 User's Guide 3. Codepad Indicators EN 8 Table 8: Mode AWAY Mode STAY Mode 1 STAY Mode 2 Arming Methods Arming Method Arms the entire system. Refer to Section Arming in AWAY Mode. Arms all zones except those programmed to be automatically isolated by the installer. Refer to Section Arming in STAY Mode 1. Arms all zones except those programmed to be automatically isolated by the Master Code holder. Refer to Section Arming in STAY Mode Forced Arming The feature of arming the system when a zone is not sealed is known as forced arming. If the system does not arm and a long beep is heard, forced arming is not permitted. If this is the case, you must ensure that all zones are sealed or manually isolated before you can arm the system. Refer to Section 8. Isolating Zones on page Arming in AWAY Mode When you leave your premises and require all zones to be in a ready state to detect intrusion, arm the system in AWAY Mode. There are two different methods for arming the system in AWAY Mode. Method one is standard and always operates. Method two is optional and can be disabled by your installer if you do not want to use single button arming. Table 9: Method One Method Two How to Arm the System in AWAY Mode Enter your user code followed by the [#] button (for example, [2580#]). Two beeps sound and the AWAY indicator displays. Exit Time starts counting. Hold down the [#] button until two beeps sound. The AWAY indicator displays and Exit Time starts counting Arming in STAY Mode 1 STAY Mode 1 is only used when the perimeter and unused areas of the premises need to be armed to detect an intruder from entering the premises. At the same time, you can move freely within an area that is automatically isolated. Only your security company can program zones automatically isolated in STAY Mode 1. 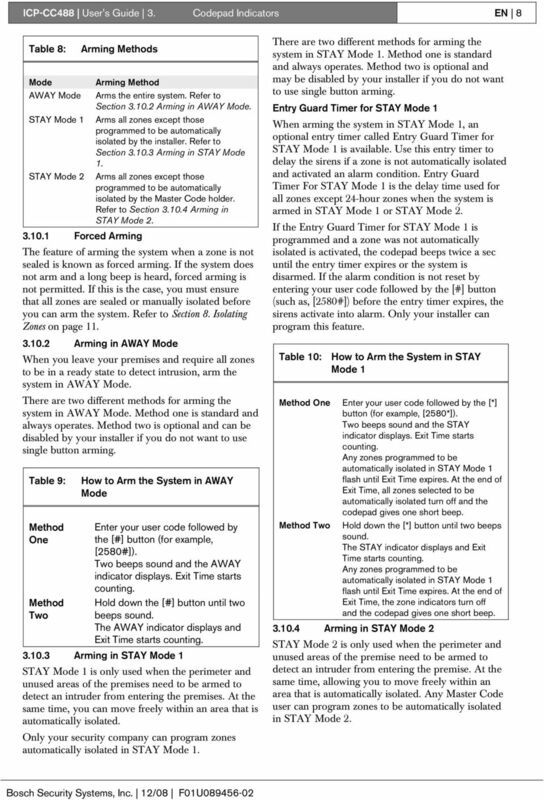 There are two different methods for arming the system in STAY Mode 1. Method one is standard and always operates. Method two is optional and may be disabled by your installer if you do not want to use single button arming. Entry Guard Timer for STAY Mode 1 When arming the system in STAY Mode 1, an optional entry timer called Entry Guard Timer for STAY Mode 1 is available. Use this entry timer to delay the sirens if a zone is not automatically isolated and activated an alarm condition. 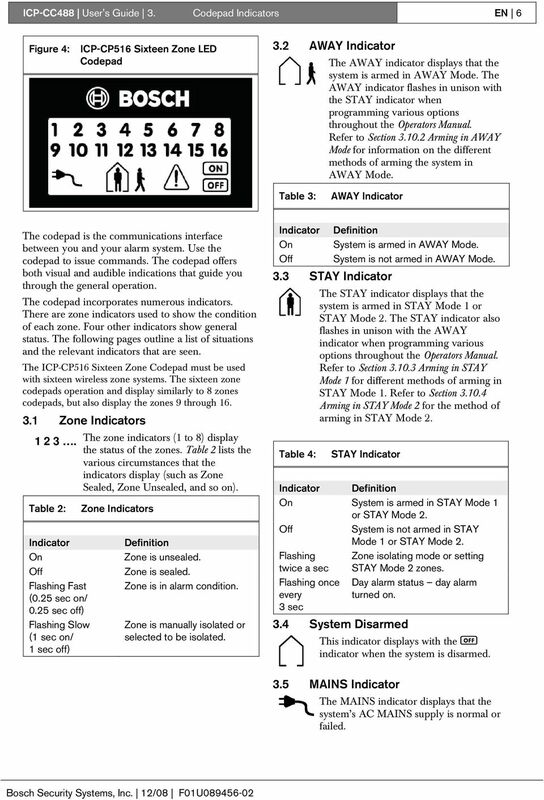 Entry Guard Timer For STAY Mode 1 is the delay time used for all zones except 24-hour zones when the system is armed in STAY Mode 1 or STAY Mode 2. If the Entry Guard Timer for STAY Mode 1 is programmed and a zone was not automatically isolated is activated, the codepad beeps twice a sec until the entry timer expires or the system is disarmed. If the alarm condition is not reset by entering your user code followed by the [#] button (such as, [2580#]) before the entry timer expires, the sirens activate into alarm. Only your installer can program this feature. Table 10: How to Arm the System in STAY Mode 1 Method One Enter your user code followed by the [*] button (for example, [2580*]). Two beeps sound and the STAY indicator displays. Exit Time starts counting. Any zones programmed to be automatically isolated in STAY Mode 1 flash until Exit Time expires. At the end of Exit Time, all zones selected to be automatically isolated turn off and the codepad gives one short beep. Method Two Hold down the [*] button until two beeps sound. The STAY indicator displays and Exit Time starts counting. Any zones programmed to be automatically isolated in STAY Mode 1 flash until Exit Time expires. At the end of Exit Time, the zone indicators turn off and the codepad gives one short beep Arming in STAY Mode 2 STAY Mode 2 is only used when the perimeter and unused areas of the premise need to be armed to detect an intruder from entering the premise. At the same time, allowing you to move freely within an area that is automatically isolated. Any Master Code user can program zones to be automatically isolated in STAY Mode 2. 9 ICP-CC488 User's Guide 4. Disarming the System EN 9 Entry Guard Timer for STAY Mode 2 When arming the system in STAY Mode 2, an optional entry timer called Entry Guard Timer for STAY Mode 2 is available. Use this entry timer to delay the sirens if a zone is not automatically isolated and activated into alarm condition. Entry Guard Timer for STAY Mode 2 is the delay time used for all zones except 24-hour zones when the system is armed in STAY Mode 1 or STAY Mode 2. If the Entry Guard Timer for STAY Mode 2 is programmed and a zone that was not automatically isolated activates, the codepad beeps twice a sec until the entry timer expires or the system is disarmed. If the alarm condition is not reset by entering your user code followed by the [#] button (for example, [2580#]) before the entry timer expires, the sirens activate into alarm. Only your installer can program this option. How to Arm the System in STAY Mode 2 Hold down the  button until two beeps sound. The STAY indicator displays and Exit Time starts counting. Any zones programmed to be automatically isolated in STAY Mode 2 flash until Exit Time expires. At the end of Exit Time, all zones selected to be automatically isolated extinguish and the codepad emits one short beep Programming STAY Mode 2 Zones Programming zones to be automatically isolated in STAY Mode 2 are only carried out if you have a Master Code. How to Program STAY Mode 2 Zones 1. Enter your four character Master Code, followed by  and the [#] button (for example, [25804#]). Three beeps sound and the STAY indicator flashes. 2. Enter the zone number to be automatically isolated, followed by the [*] button (for example, [1*] = Zone 1, [2*] = Zone 2). The selected zone flashes. If you make a mistake, enter the same zone number followed by the [#] button to clear the incorrect zone. To select additional zones to be automatically isolated in STAY Mode 2, repeat Step 2 as many times as required. 3. Press the [#] button to exit this mode when you finish selecting all zones to be automatically isolated in STAY Mode 2. Two beeps sound and the STAY and AWAY indicators turn off. 4. Disarming the System When you enter the premises after the system is armed in AWAY mode, or if you armed the system in STAY Mode 1 or STAY Mode 2, you must disarm the system to disable detection devices that activate an alarm. If there was an alarm condition prior to disarming the system, a flashing zone indicator displays, indicating a previous alarm on that zone. How to Disarm the System Enter your user code followed by the [#] button (for example, [2580#]). Two beeps sound. 5. User Codes 5.1 Adding User Codes Only the Master Code holder can add or change other system user codes, including the Master Code. Up to eight user codes can be programmed to operate the system. How to Add a User Code 1. Enter your four character Master Code, followed by  and the [#] button (for example, [25801#]). Three beeps are heard and the STAY and AWAY indicators flash. 2. Enter the User Code number (1 to 8), followed by the [#] button (for example, [2#] = User 2, [8#] = User 8). Two beeps are heard and the selected user number displays on the codepad indicators. 3. Enter the digits required for the new code followed by the [#] button (for example, for User Code 5768, enter [5768#]). Two beeps are heard and the STAY and AWAY indicators turn off. To add or change other User Codes, repeat this procedure as many times as required. 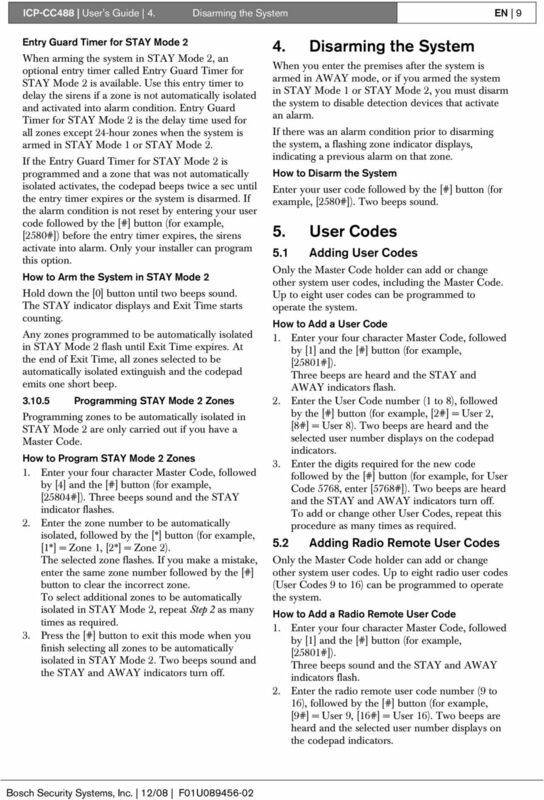 5.2 Adding Radio Remote User Codes Only the Master Code holder can add or change other system user codes. Up to eight radio user codes (User Codes 9 to 16) can be programmed to operate the system. How to Add a Radio Remote User Code 1. Enter your four character Master Code, followed by  and the [#] button (for example, [25801#]). Three beeps sound and the STAY and AWAY indicators flash. 2. Enter the radio remote user code number (9 to 16), followed by the [#] button (for example, [9#] = User 9, [16#] = User 16). Two beeps are heard and the selected user number displays on the codepad indicators. 11 ICP-CC488 User's Guide 7. Codepad Alarms EN Codepad Alarms 7.1 Codepad Duress Alarm A codepad duress alarm is used as a silent hold-up alarm. This only occurs when the number 9 is added to the end of any valid user code being used to disarm the system (for example, [25809#]). A duress alarm is only useful if your system is reporting back to a monitoring station or pocket pager. Domestic reporting (such as a mobile phone) cannot decipher which type of alarm occurred. 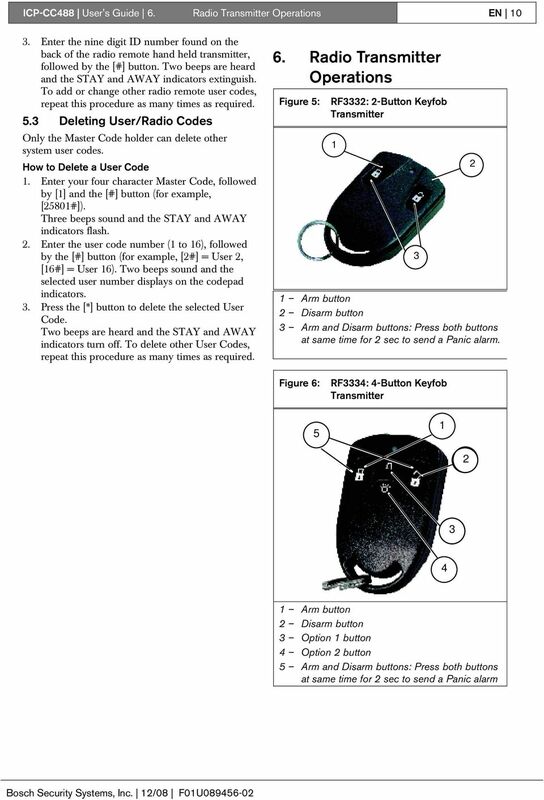 Figure 7: ICP-CP508W LED Codepad Showing Audible Alarm Buttons 7.2 Codepad Panic Alarm An audible alarm activates when you press the  and  keys or the [*] and [#] keys simultaneously. Contact your installer to disable the codepad panic alarm function or to silence the codepad panic alarm. 7.3 Codepad Fire Alarm The horn speaker emits a distinct fire sound when you press the  and  keys simultaneously. Contact your installer to disable the codepad fire alarm function or to silence the codepad fire alarm. 7.4 Codepad Medical Alarm An audible codepad Medical Alarm activates when you press  and  simultaneously. Contact your installer to disable the codepad medical alarm function or to silence the codepad medical alarm. 7.5 Codepad Tamper Alarm (Access Denied) Codepad tamper restricts the number of times an invalid user code can be used in an attempt to operate the system. When the number of incorrect code attempts equals the number programmed by your installer, the system activates an alarm condition. If reporting back to a security monitoring station, the system sends an Access Denied report. To shutdown and lockout a codepad for a period of time (0 sec to 150 sec), ask your installer to program this function. 8. Isolating Zones Use isolating zones to manually disable one or more zones before arming the system. Once a zone is isolated, you can access that zone during the armed state without activating an alarm. For example, you need to isolate a zone because before arming the system a PIR detector may be false alarming, or you need to leave a pet inside a particular zone while away. Isolating zones is performed by one of two methods. Method two is optional and only allows those user codes programmed by your installer to have access to isolate zones. 8.1 Standard Isolating Standard isolating allows all operators to isolate zones without knowing a valid user code. How to Isolate a Zone 1. Press the [*] button twice to enter the Isolating Mode. Three beeps are heard and the STAY indicator flashes. 2. Enter the zone number (1 to 8), followed by the [*] button (for example, [1*] = Zone 1, [2*] = Zone 2). Each zone to be isolated has a corresponding zone indicator that flashes. If you selected an incorrect zone to be isolated, enter the incorrect zone number again followed by the [*] button. Repeat Step 2 if more than one zone is to be isolated until all zones to be isolated are selected. 3. Press the [#] button after all selected zones are isolated. Two beeps are heard and the system returns to the disarmed state. 13 ICP-CC488 User's Guide 10. 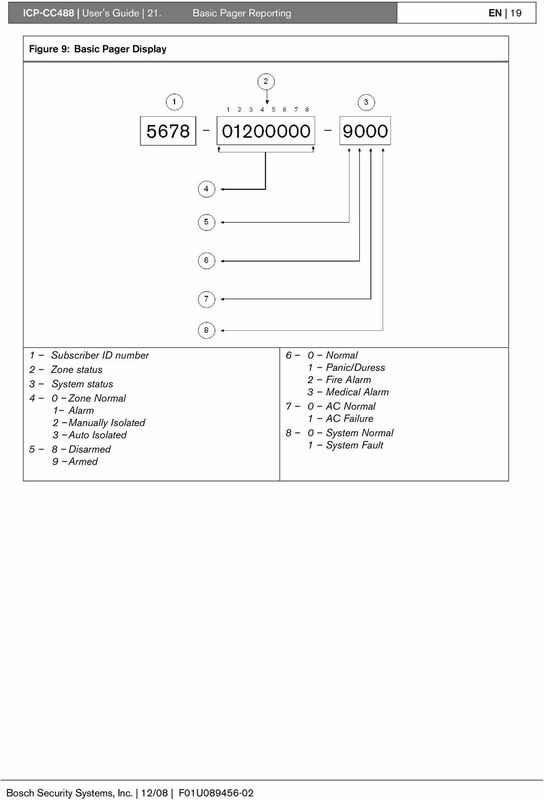 Date and Time EN Fault Descriptions 1 System Fault A system fault only displays when any of the following faults occur. After entering Fault Analysis Mode, press and hold the  key to determine which of the following faults occurred. Low Battery Fault A low battery fault registers when the system detects a low capacity back-up battery. The system automatically performs a battery test every four hours and every time you arm the system. Date and Time The date and time fault registers every time the system is powered down. This type of fault does not cause the FAULT indicator to display on the codepad unless your installer programmed the automatic arming time. Refer to Section 10. Date and Time on page 13 to program the date and time. RF Receiver Fail The RF receiver fault registers once the system detects that the wireless receiver unit is disconnected. Horn Speaker Fail This fault registers when the system detects that the horn speaker is disconnected. This fault clears once the horn speaker is reconnected. Your installer must program the system for this feature to operate. Telephone Line Fail A telephone line fault registers when the system detects that the telephone line is disconnected from the control panel. Your installer must program the system for this feature to operate. EEPROM Fail An EEPROM fail registers when the system detects an internal checksum error. Contact your installer as soon as this fault displays. AUX Power Supply Fail This fault occurs when either of the two 1 A AUX power supplies fails. Contact your installer as soon as this fault displays. 2 RF Low Battery This fault occurs when any of the RF wireless devices report a low battery condition to the control panel. While in Fault Analysis Mode, press and hold the  key until two beeps sound. This displays the zone reporting the RF Low Battery fault. 3 Zone Tamper Fail This fault occurs when any zone becomes an open circuit. Press and hold the  key until two beeps sound. This displays the zone reporting the tamper fail fault. 4 Sensor Watch Fault A sensor watch fault registers because one or more detection devices failed to detect any movement during the disarmed state for the time period programmed by your installer. The fault clears once the zone in question detects movement and resets. Press and hold the  key until two beeps sound. This displays the zone reporting the sensor watch fault. 5 RF Sensor Watch An RF sensor watch fault registers because one or more RF detection devices fails to communicate to the RF radio receiver for the time period programmed by your installer. The fault clears once the RF device in question successfully transmits to the RF radio receiver. Press and hold the  key until two beeps sound. 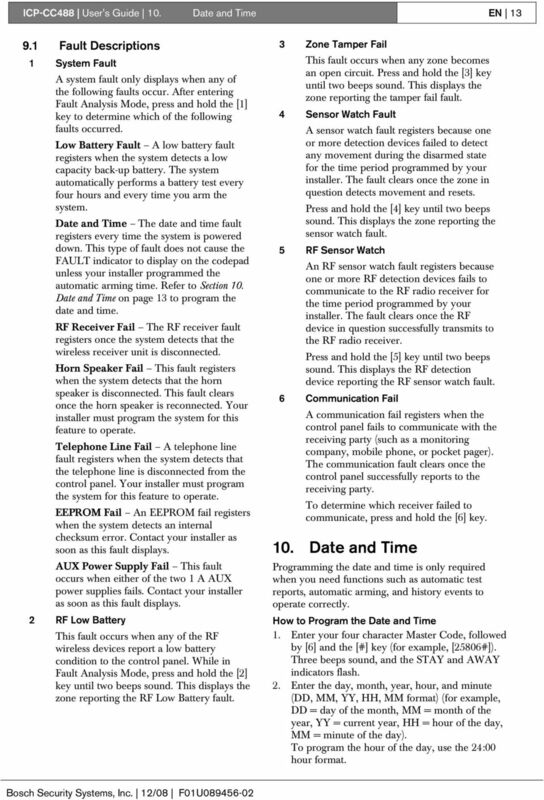 This displays the RF detection device reporting the RF sensor watch fault. 6 Communication Fail A communication fail registers when the control panel fails to communicate with the receiving party (such as a monitoring company, mobile phone, or pocket pager). The communication fault clears once the control panel successfully reports to the receiving party. To determine which receiver failed to communicate, press and hold the  key. 10. Date and Time Programming the date and time is only required when you need functions such as automatic test reports, automatic arming, and history events to operate correctly. How to Program the Date and Time 1. Enter your four character Master Code, followed by  and the [#] key (for example, [25806#]). Three beeps sound, and the STAY and AWAY indicators flash. 2. Enter the day, month, year, hour, and minute (DD, MM, YY, HH, MM format) (for example, DD = day of the month, MM = month of the year, YY = current year, HH = hour of the day, MM = minute of the day). To program the hour of the day, use the 24:00 hour format. 14 ICP-CC488 User's Guide 11. Turning Outputs On/Off EN Press the [#] button to exit and return to the disarmed state. Two beeps sound, and the STAY and AWAY indicators turn off. If a long beep sounds, an error was made when entering the date and time. 11. Turning Outputs On/Off This feature is only applicable if your installer set up an output that can be turned on or off by the codepad. The output programmed by your installer can control a pool pump or outside lighting. Up to three separate outputs can be programmed. How to Turn an Output On or Off 1. Enter your four character Master Code, followed by  and the [#] key (for example, [25805#]). Three beeps sound and the STAY and AWAY indicators flash. 2. Enter the output number (1 to 3). 3. Press the [#] key to turn the output on, or press the [*] key to turn the output off. Three beeps sound if the output is turned on, and two beeps sound if the output is turned off. Repeat Step 2 and Step 3 if more than one output is required to be turned on or off. 4. Press the [#] key to exit from this function. Two beeps sound and the STAY and AWAY indicators turn off. 12. Reset Latching Outputs This feature is only applicable if your installer programmed an output to latch (remain on) until you acknowledge the event that occurred. How to Reset Latching Outputs Hold down the  key until two beeps sound. The output resets. 13. 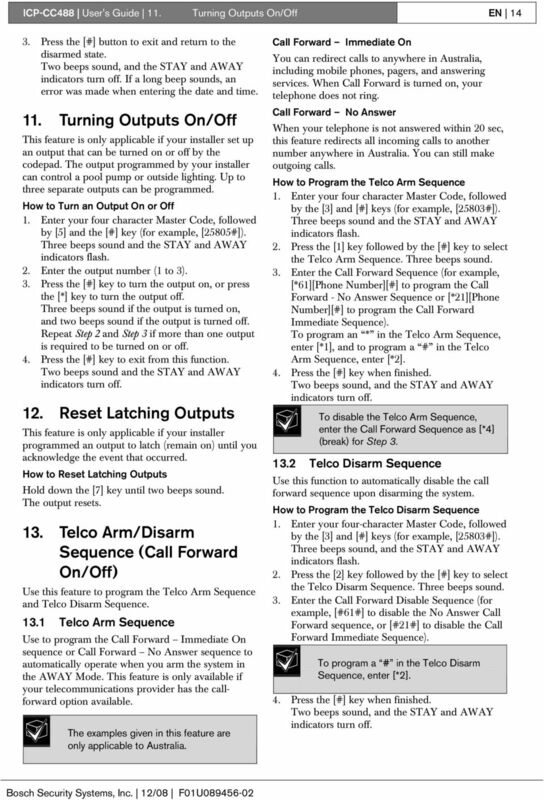 Telco Arm/Disarm Sequence (Call Forward On/Off) Use this feature to program the Telco Arm Sequence and Telco Disarm Sequence Telco Arm Sequence Use to program the Call Forward Immediate On sequence or Call Forward No Answer sequence to automatically operate when you arm the system in the AWAY Mode. This feature is only available if your telecommunications provider has the callforward option available. The examples given in this feature are only applicable to Australia. Call Forward Immediate On You can redirect calls to anywhere in Australia, including mobile phones, pagers, and answering services. When Call Forward is turned on, your telephone does not ring. Call Forward No Answer When your telephone is not answered within 20 sec, this feature redirects all incoming calls to another number anywhere in Australia. You can still make outgoing calls. How to Program the Telco Arm Sequence 1. Enter your four character Master Code, followed by the  and [#] keys (for example, [25803#]). Three beeps sound and the STAY and AWAY indicators flash. 2. Press the  key followed by the [#] key to select the Telco Arm Sequence. Three beeps sound. 3. Enter the Call Forward Sequence (for example, [*61][Phone Number][#] to program the Call Forward - No Answer Sequence or [*21][Phone Number][#] to program the Call Forward Immediate Sequence). To program an * in the Telco Arm Sequence, enter [*1], and to program a # in the Telco Arm Sequence, enter [*2]. 4. Press the [#] key when finished. Two beeps sound, and the STAY and AWAY indicators turn off. To disable the Telco Arm Sequence, enter the Call Forward Sequence as [*4] (break) for Step Telco Disarm Sequence Use this function to automatically disable the call forward sequence upon disarming the system. How to Program the Telco Disarm Sequence 1. Enter your four-character Master Code, followed by the  and [#] keys (for example, [25803#]). Three beeps sound, and the STAY and AWAY indicators flash. 2. Press the  key followed by the [#] key to select the Telco Disarm Sequence. Three beeps sound. 3. Enter the Call Forward Disable Sequence (for example, [#61#] to disable the No Answer Call Forward sequence, or [#21#] to disable the Call Forward Immediate Sequence). To program a # in the Telco Disarm Sequence, enter [*2]. 4. Press the [#] key when finished. Two beeps sound, and the STAY and AWAY indicators turn off. 15 ICP-CC488 User's Guide 14. Testing EN 15 To disable the Telco Disarm Sequence, enter the Call Forward Sequence as [*4] (break) for Step 3. Table 12: Telco Arm/Disarm Dialing Digits Digit Required Number to Program Digit Required * *1 4 4 # * sec *3 Pause 6 6 Break * Testing Number to Program The following functions let you confirm that your system is operating correctly: 14.1 Horn Speaker Test Hold the  key until two beeps sound. The horn speaker sounds for 2 sec Bell Test Hold the  key until two beeps sound. The bell output operates for 2 sec Strobe Test 1. Hold the  key until three beeps sound. The strobe flashes. 2. Hold the  key until two beeps sound. The strobe stops flashing Walk Test Mode Use Walk Test Mode to test detection devices to ensure that they are operating correctly. Every time you test a zone, the codepad sounds one long beep, and the horn speaker sounds one short beep to indicate that the zone is activated when testing. 1. Enter your four character Master Code, followed by the  and [#] keys (for example, [25807#]). Three beeps sound, and the STAY and AWAY indicators flash. The codepad beeps once every sec while the system is in Walk Test Mode. 2. Activate all zones requiring the test. 3. When you finish testing all required zones, press the [#] key to exit from this mode. Two beeps sound, and the STAY and AWAY indicators turn off. The system returns to the disarmed state Test Report This feature only applies if your system reports using the telephone. By holding down the  key until two beeps sound, the system sends a Test Report. 15. Event Memory Use this function to replay the last 40 events that the system recorded. The event memory history replays all alarms and the arming/disarming of the system in AWAY Mode, STAY Mode 1, and STAY Mode 2. However, the system cannot differentiate between arming the system in STAY Mode 1 or STAY Mode 2. How to Enter Event Memory Enter your four-character Master Code, followed by  and the [#] button (for example, [25808#]). Three beeps sound. The last 40 events display one at a time by the codepad indicators, starting with the most recent event. A beep sounds as each event displays. 16. Day Alarm Day alarm monitors a combination of zones during the disarmed state. It beeps the codepad buzzer if activated. Only your installer can program zones 1 to 4 to operate for day alarm. Example A day alarm can be configured for the front door of a shop with a pressure mat or electronic beam that customers activate as they enter the shop. When customers step on the pressure mat or break the electronic beam, the codepad buzzer beeps. How to Turn Day Alarm On Hold down the  key until three beeps sound. Day alarm turns on. 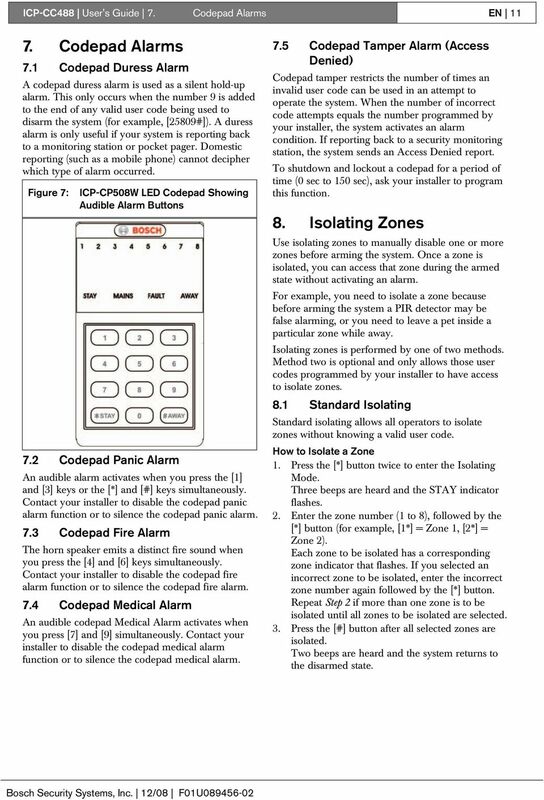 All zones programmed for day alarm operation cause the codepad buzzer to beep during the disarmed state when activated. How to Turn Day Alarm Off Hold down the  key until two beeps sound. Day alarm turns off. 17. Codepad Buzzer Tone Change Hold down the  key to change the tone of the codepad buzzer. There are 50 different tones, from 1500 Hz to 5000 Hz. If multiple codepads are installed, each codepad can have a different tone. 17 ICP-CC488 User's Guide 20. Domestic Dialling EN 17 PARTIAL Indicator Only displays when an area is armed in STAY Mode 1. (For example, if the PARTIAL indicator is displayed, an area is armed in STAY Mode 1. If the PARTIAL indicator is not displayed, no areas are armed in STAY Mode 1.) 19.2 Operation of Codepads in Partitioning Area Addressable Codepad Operations If you have a system partitioned with Area Addressable eight-zone codepads, the operating procedure is the same as described for a nonpartitioned system, except that all operations only relate to the area the codepad is assigned to. Master Partitioned Codepad Operations If your system is partitioned with a Master Partitioned codepad installed, the operating procedure is the same as described for a nonpartitioned system, except that all operations relate to the area displayed by the Area Display indicator. Example If the Area Display indicator displays number 2, all operations performed only operate in Area 2. To operate Area 1, you must toggle the Area Display indicator to number 1 by pressing the [#] key. Pressing the [#] key again toggles you back to the Area 2 display. 20. Domestic Dialling Use domestic dialing can be used to call your mobile phone or a relative/friend if your control panel activates an alarm. Up to three different telephone numbers can be programmed for the control panel to call when an alarm occurs. Only your installer can program the system to report in the domestic format. The Master Code holder can change the telephone numbers at any time Acknowledging Domestic Calls When an alarm condition occurs, the system calls the first programmed telephone number. When you answer an incoming call, the system repeatedly emits a siren tone followed by a pause, continuously for 2 min (for example, siren tone, pause, siren tone, and pause). If you do not acknowledge the call from the control panel during a pause between siren tones, the control panel hangs up after 2 min and calls the next telephone number. Pressing the [*] key for 1 sec to 3 sec during the pause acknowledges the call. No further calls are made for that event. If the call was successfully acknowledged, a tone of decreasing pitch sounds. 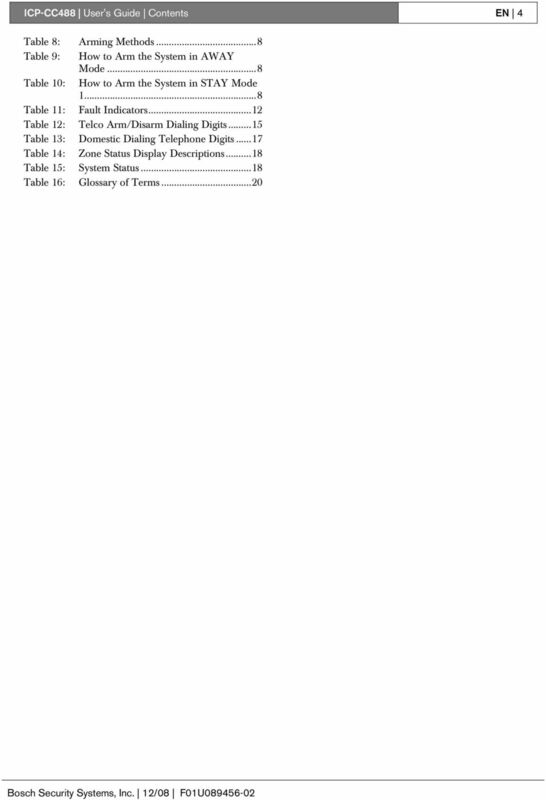 Table 13: Domestic Dialing Telephone Digits Digit Required Number to Program Digit Required * *1 4 4 # * sec Pause *3 6 6 Break *4 7 7 Number to Program 20.2 Programming Domestic Telephone Numbers If your system is set up for domestic dialing, any Master Code holder can program telephone numbers that the control panel calls in the event of an alarm. How to Program Telephone Numbers 1. Enter your four character Master Code, followed by the  and [#] keys (for example, [25802#]). Three beeps sound and the STAY and AWAY indicators flash. If there are telephone numbers already programmed, they display one digit at a time by the codepad indicators. If there are no telephone numbers programmed, two more beeps sound after entering this mode. These two beeps normally sound after the last digit of the last telephone number displays. 2. Enter all digits for the first telephone number (for example, [ ]). As each digit is entered, the corresponding codepad indicators display. 3. If there is more than one telephone number to program, press [*4]. This inserts a break between the first telephone number and the sec telephone number. If there is only one telephone number to program, press the [#] key to exit from this function. 4. Enter all the digits of the second telephone number (for example, [ ]). As each digit is entered, the corresponding codepad indicators display. 5. After the last digit of the second telephone number is programmed, press the [#] key to exit from this function unless a third telephone number is required. 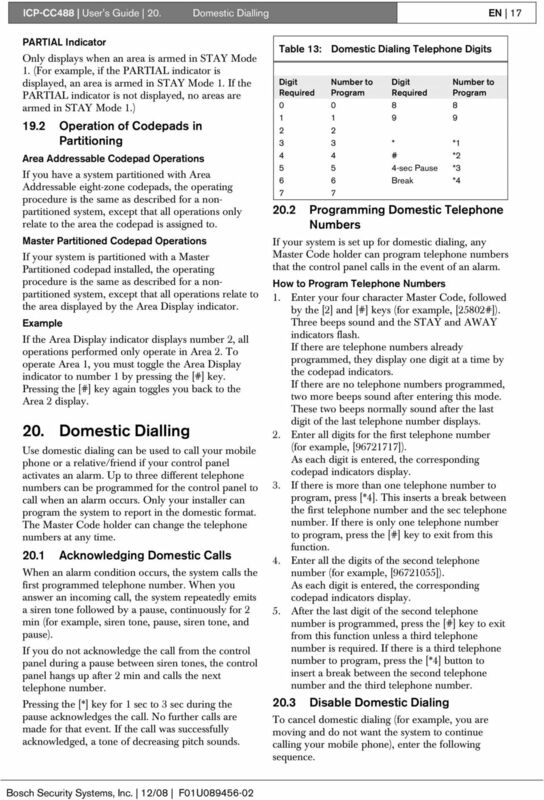 If there is a third telephone number to program, press the [*4] button to insert a break between the second telephone number and the third telephone number Disable Domestic Dialing To cancel domestic dialing (for example, you are moving and do not want the system to continue calling your mobile phone), enter the following sequence. 18 ICP-CC488 User's Guide 21. Basic Pager Reporting EN Enter your four character Master Code, followed by the  and [#] keys (for example, [25802#]). Two beeps sound and the STAY and AWAY indicators flash. 2. Press the [*] key followed by the  and [#] keys (for example, [*4#]). The STAY and AWAY indicators are disabled. 21. Basic Pager Reporting This feature only applies if your system reports to a pocket pager. 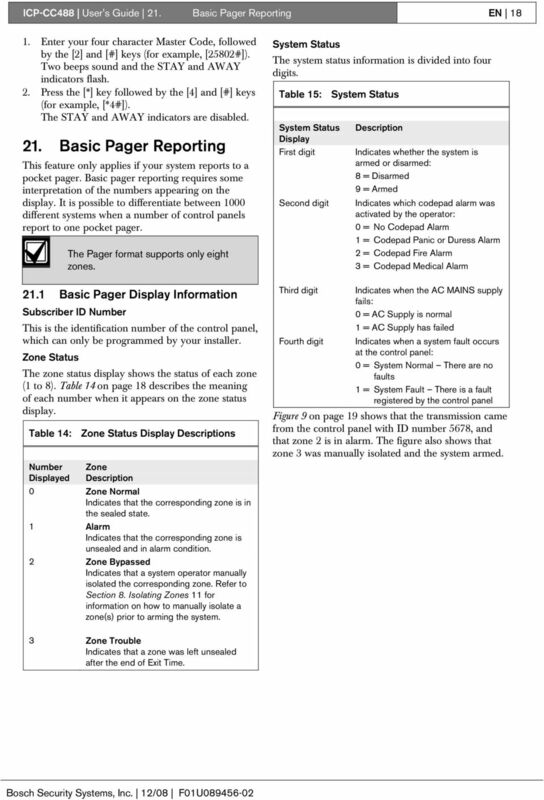 Basic pager reporting requires some interpretation of the numbers appearing on the display. It is possible to differentiate between 1000 different systems when a number of control panels report to one pocket pager. The Pager format supports only eight zones Basic Pager Display Information Subscriber ID Number This is the identification number of the control panel, which can only be programmed by your installer. Zone Status The zone status display shows the status of each zone (1 to 8). 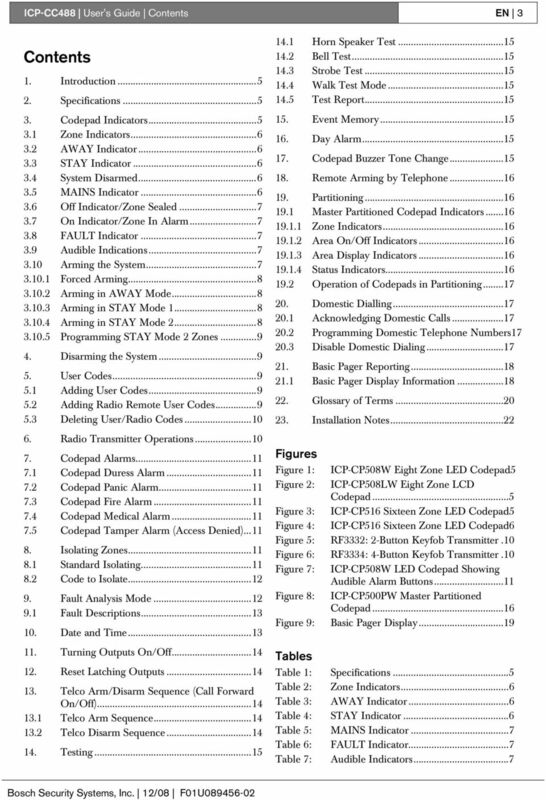 Table 14 on page 18 describes the meaning of each number when it appears on the zone status display. Table 14: Zone Status Display Descriptions Number Displayed Zone Description 0 Zone Normal Indicates that the corresponding zone is in the sealed state. 1 Alarm Indicates that the corresponding zone is unsealed and in alarm condition. 2 Zone Bypassed Indicates that a system operator manually isolated the corresponding zone. Refer to Section 8. Isolating Zones 11 for information on how to manually isolate a zone(s) prior to arming the system. System Status The system status information is divided into four digits. Table 15: System Status System Status Display First digit Second digit Description Indicates whether the system is armed or disarmed: 8 = Disarmed 9 = Armed Indicates which codepad alarm was activated by the operator: 0 = No Codepad Alarm 1 = Codepad Panic or Duress Alarm 2 = Codepad Fire Alarm 3 = Codepad Medical Alarm Third digit Indicates when the AC MAINS supply fails: 0 = AC Supply is normal 1 = AC Supply has failed Fourth digit Indicates when a system fault occurs at the control panel: 0 = System Normal There are no faults 1 = System Fault There is a fault registered by the control panel Figure 9 on page 19 shows that the transmission came from the control panel with ID number 5678, and that zone 2 is in alarm. The figure also shows that zone 3 was manually isolated and the system armed. 3 Zone Trouble Indicates that a zone was left unsealed after the end of Exit Time. 20 ICP-CC488 User's Guide 22. Glossary of Terms EN Glossary of Terms Table 16: Glossary of Terms Term 24-hour zone alarm condition answering machine bypass area codepad Armed (System ON) automatic arming automatic disarming AWAY Mode codepad day alarm detector disarmed dynamic battery testing entry delay external equipment force arming hand-over delay hand-held radio remote control isolate master code master partitioned codepad monitoring station Description A monitored input where tamper switches and emergency switches can be connected. If one of these switches is violated at any time (whether the system is armed or disarmed), an alarm is reported. The status when an alarm system is armed and one of the detection devices is violated. A 24-Hour zone (for example, a smoke detector) can activate when the system is armed or disarmed. A condition that enables connection with the control panel for remote arming or remote programming operations when there is an answering machine or facsimile machine on the same telephone line. A device used to communicate with a system that is partitioned into two separate areas. All commands you issue with the area codepad affect only the designated area, and not the other area. A status in which the system is ready to accept alarms. Programming that allows the system to arm automatically at the same time each day in AWAY Mode or STAY Mode 1. Programming that allows the system to disarm automatically at the same time each day in AWAY Mode or STAY Mode 1. The mode used to arm your system when you leave your premises. A device that allows you to perform all functions such as arming, disarming, and programming of your alarm system. Programming that allows a combination of zones to be monitored while the system is disarmed. A unit installed as a satellite component in a security system designed to detect an intruder within a protected area. Some common forms of detection devices are passive infrared, smoke, photo electric beams, reed switches, and vibration sensors. A system status that does not accept alarms, except for 24-Hour zones. A method used to monitor and test the condition of your backup battery. A programmed delay of the system alarm responses that allows a person to enter a building through the entry door to turn the system off. Any device connected to a security system, such as a detector, codepad, or siren. A method of overriding the safety feature that prevents arming with a faulted zone on a control panel. If a system is armed and Zone 1 is violated, the entry delay starts timing. If Zone 2 is violated, the entry delay time is handed over to the Zone 2 and so on, to Zones 3 and 4. This is known as sequential hand-over delay. A device used to arm and disarm a security system or to cause a panic alarm. 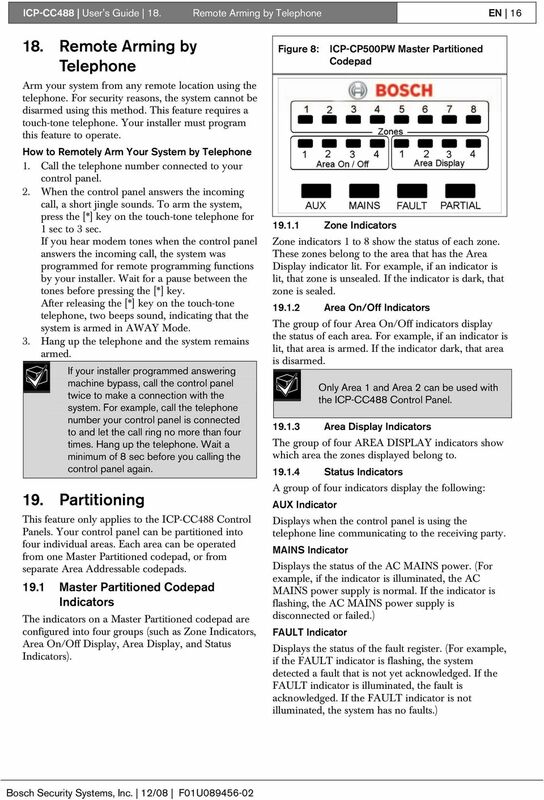 A method of manually disabling (isolating) one or more zones before arming the system. A numeric code used for arming and disarming the system, and for allowing access to all functions available through the codepad. A device used to communicate with a system that is partitioned into two separate areas. You can issue commands to both areas using the same codepad. A secure location where a digital receiver monitors a number of alarm systems and deciphers their alarm transmission reports so the operator can advise the appropriate authorities to take immediate action.